Satyam Jewellery NX, Mumbai, established in the year 1999, is among the prominent manufacturers, wholesalers, suppliers, traders, distributors and exporters of a wide array of premium quality designer jewellery. Our effective product range is inclusive of Designer Earrings, Designer Bangles and Pendant Set. 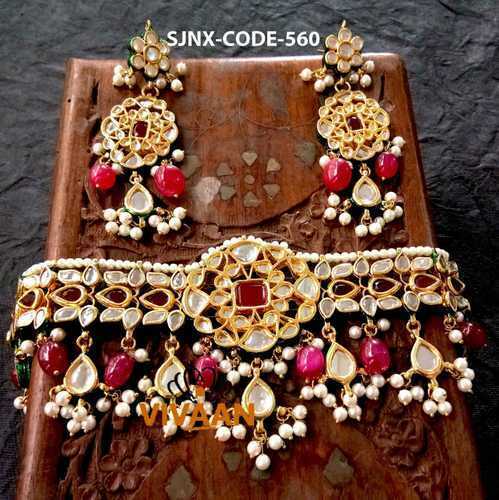 These jewelry pieces are precisely crafted from optimum quality metals, pearls and precious & semi-precious stones that are procured from well known vendors. These jewelry pieces are highly appreciated for their unique pattern, appealing look, well polish and impeccable finish. Some of the countries wherein our offering are exported to are Saudi Arabia, African Country, Malaysia, Japan, Singapore, Canada, Australia. We have been backed by a state-of-the-art infrastructure that spreads over a vast area of land. Our infrastructure facility is segregated into various units, to ensure smooth operations. To ensure storage of the offered jewelry pieces as per the industry laid standards, we have built spacious warehouse unit. Our warehouse unit is equipped with different types of equipment and tool required for safe storage of these jewelry pieces. To ensure effective handling of our warehouse unit, we have appointed different professionals. These professionals have helped us in carving a unique niche in this domain.